Make yourself at home in one of the 29 guestrooms featuring DVD players. Complimentary wireless Internet access is available to keep you connected. Bathrooms have showers and hair dryers. Make yourself at home in one of the guestrooms featuring refrigerators and flat-screen televisions. Private bathrooms with showers feature complimentary toiletries and hair dryers. For your convenience, a complimentary breakfast is served daily from 8:30 AM to 9:30 AM. 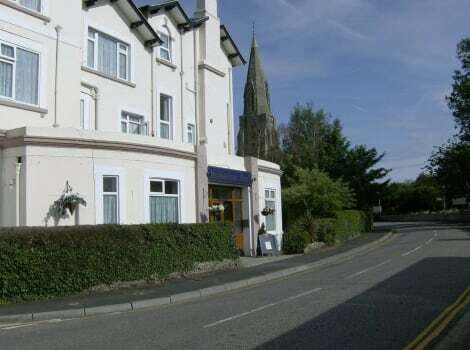 When you stay at The Belmont Hotel in Shanklin, you'll be in the historical district, within a 10-minute walk of Shanklin Chine and Shanklin Theatre. This 4-star bed & breakfast is 18.3 mi (29.5 km) from Gunwharf Quays and 18.6 mi (29.9 km) from Spinnaker Tower. Make yourself at home in one of the 32 guestrooms. Complimentary wireless Internet access is available to keep you connected. Bathrooms with shower/tub combinations are provided. The award-winning 5-star Foxhills guest house features a garden and an on-site beauty therapy and massage room. Free Wi-Fi and free on-site parking are also provided. Guests can start their day with a selection of fresh fruits, yogurts and cereal followed by our award-winning breakfasts including scrambled eggs, smoked salmon, Black pudding and a full English Breakfast. Garden views are a feature of several Foxhills rooms, as well as an en suite bath or shower rooms, flat-screen TV with DVD player, and tea/coffee making facilities. After a long day of exploring, guests can relax in the terraced gardens or comfortable lounge with log burner. Foxhills is fully licensed. Shanklin town centre and The Old Village are both within 10 minutes’ walk, and Shanklin railway station is only 0.7 miles away. Relax on the private beach or enjoy other recreational amenities such as an outdoor pool and an indoor pool. Additional amenities at this hotel include complimentary wireless Internet access, an arcade/game room, and a television in a common area. Make yourself at home in one of the 58 guestrooms. Complimentary wireless Internet access is available to keep you connected. Bathrooms have shower/tub combinations and hair dryers. Conveniences include separate sitting areas and coffee/tea makers, and housekeeping is provided daily. 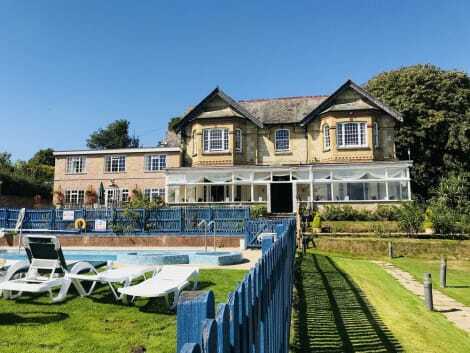 With a stay at Luccombe Hall Country House Hotel in Shanklin, you'll be by the sea, just a 1-minute walk from Rylstone Gardens and 9 minutes by foot from Shanklin Chine. This family-friendly hotel is 18.9 mi (30.4 km) from Gunwharf Quays and 19.1 mi (30.8 km) from Spinnaker Tower. Set in a popular seaside town on Sandown Bay, Shanklin Hotels are an ideal base for exploring the shops, beaches and green spaces of the Isle of Wight. One of the better-known beaches on the Isle of Wight is Shanklin Beach, a stretch of golden sand that attracts visitors from all over the UK. Whether you plan on making sandcastles with the kids, paddling out into the sea or simply lounging around with a good book, Shanklin Beach is a fantastic summer destination. Beside the beach itself is the town's seafront promenade, Shanklin Esplanade. Here you'll find a wide range of attractions, from amusement arcades to a pirate-themed mini golf park. Dotted along the promenade are a selection of cafés, restaurants and pubs serving everything from ice cream to bottles of beer. Away from Shanklin Beach is the nearby Small Hope Beach, a quieter stretch that helps make up the Bay Area running from Shanklin to Yaverland. This beach is popular with families and features a line of beach huts that can be hired at a small cost. Also within easy reach of Shanklin are Lake Beach, a popular destination for swimmers, and Sandown Beach, one of the Isle of Wight's finest beaches and home to another selection of traditional seaside cafés, amusement arcades and pubs. A short trip from the town centre will take you to Shanklin Chine, a dramatic gorge that features waterfalls and a number of woodland walks. With indigenous plant life that has a history reaching back to the times of the dinosaurs, Shanklin Chine is a primeval spot away from the hustle and bustle of the seafront. The gorge features a Heritage Centre Exhibition that includes details from William Daniell's A Voyage Round Great Britain and a number of paintings by JMW Turner. Towards the beach from Shanklin Chine is Fisherman's Cottage, dating from the 19th century and home to a restaurant that serves delicious British food and real ale. If you're travelling with kids in tow, the Isle of Wight Zoo is a fun and engaging place to spend a few hours. Set beside Sandown Bay, the zoo features a number of big cats including lions, tigers and jaguars. Also worth checking out if you're interested in wildlife is Amazon World Zoo Park, a large zoo that includes jungle habitats full of exotic animals.